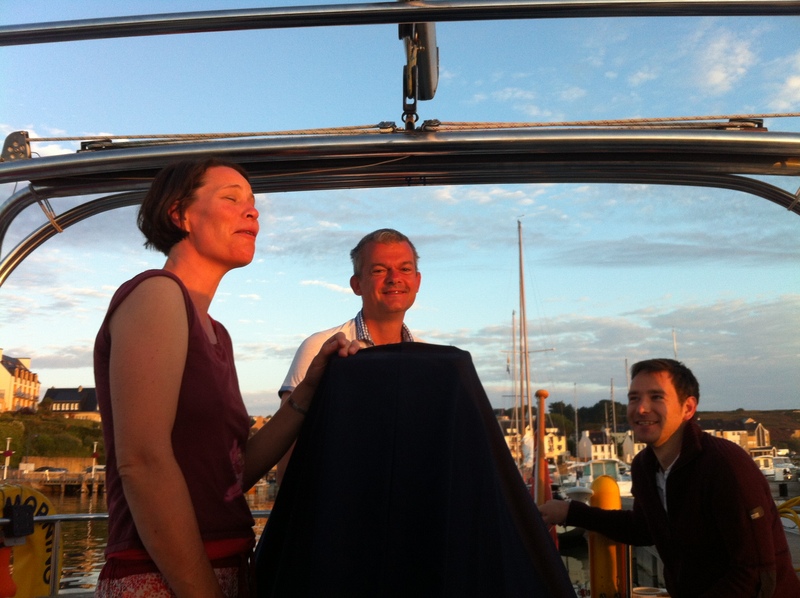 Sailing Brittany VI: the Fellowship of the White Mast. Having survived the beautiful weather; low winds; our horsing around at sea and- for me personally- about two hours in the sea, acting as dummy in the safety drill for Mike’s new Man-over-Board procedure, (and deservedly winning my two Oscars in the process) we finally arrive at Cameret-sur-Mer. It has been a good day’s sailing. The approach from the sea to the town is guarded, (rather melodramatically in my view), by a large red-brick fort. For extra impact, there are a few large old boat wrecks nearby, rotting in the sun, their timbers half-gone, ribs exposed. They appear to have been grounded on the beach years ago, and never released. This could be you– they seem to warn- if you don’t watch your course. Cameret is described rather patronizingly, in some travel guides as a “fading seaside resort”. But, even as we sail into harbour, we like the look of it. It’s certainly a more significant place than our previous one-café stop of L’Aberwrach. Even L’Aberwrach we were rather taken with, after the marathon darkness of our nighttime Channel crossing. But Cameret appears a step up. Even from the deck of our boat, we can see there are several cafes here, a few restaurants and, as is routine in Brittany, the usual plethora of Crepe shops, selling the traditional Breton pancakes. We try to moor up. But there is a horrendous confusion about where we can and cannot tie-up. Most of the berths are of course owned by and reserved for locals. But all French harbours have guest berths. They just don’t have enough of them. The harbor master is an absolute gentleman. He flys around, on foot and by boat, trying to secure us an available slot. But even for him, it’s tricky. We have to patient, although everyone is so polite and pleasant this is not difficult. With one or two rare exceptions, this is my overwhelming experience of the French, (perhaps particularly the Bretons?) throughout our 8-day trip; thoroughly decent, friendly, and unfailingly polite. At last we get a spot. We go harbormaster’s office to settle our fees. Then to the facilities block just next door, to shower, shave and change. There is nothing quite as relaxing as after a days sailing, pleasantly tired, blasted by the sun, looking forward to a drink before dinner. 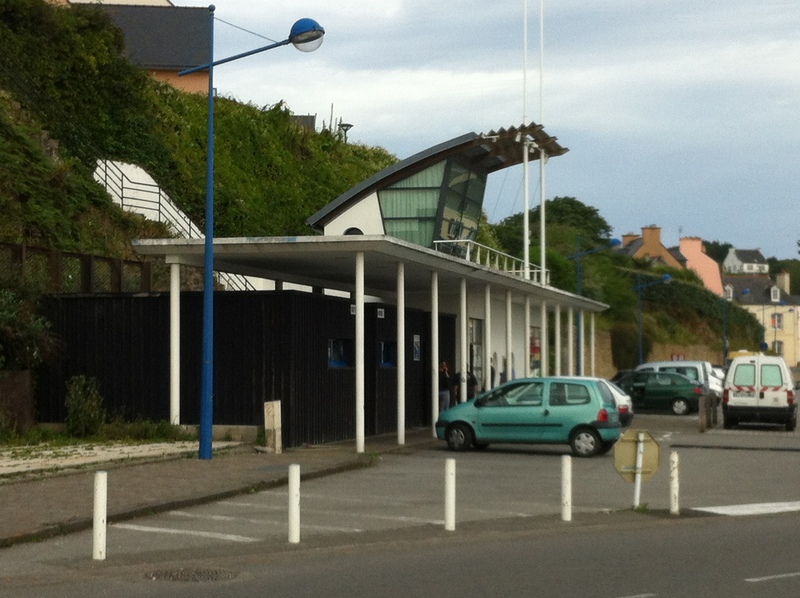 Wherever we go in Brittany, I am fascinated by the architecture of these harbormaster offices, and indeed the shower blocks alongside. They tend to a pattern, and it’s a good one, all white-painted, streamlined modernism, and sea-inspired sweeping curves. 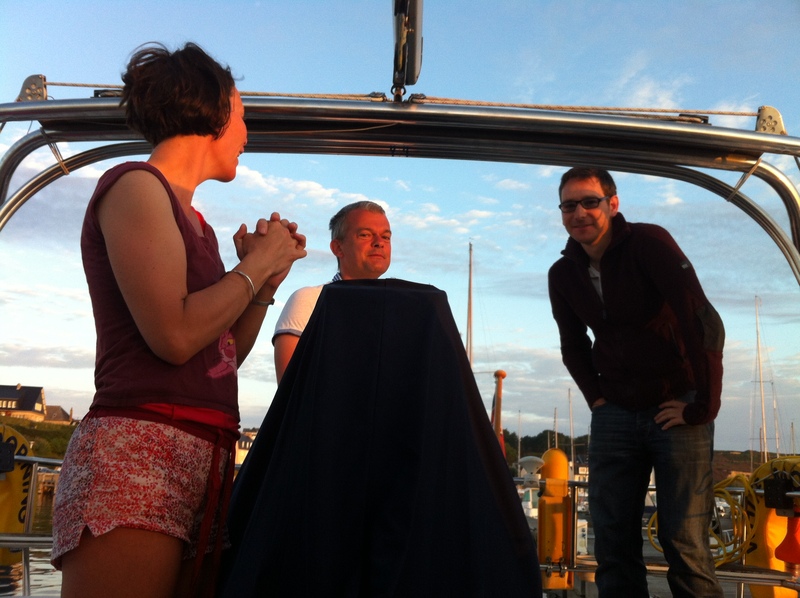 During our long wait for a berth we have already chatted with a nice sailing couple from Birmingham. Their friendly, down-to earth manner is in pleasant but still amusing contrast to their monster-sized, state of the art yacht. Typical with touring yachtsfolk, we share our plans. The man does us a good turn and give is what turns out to be excellent advice. Learniung of our route, he tells us bluntly that our next planned stop is “a kip”. He suggests instead we break up our trip, sailing first to overnight at Audierne, then making a second run the following day, to the walled port-city of Concarneau. We have a look at our maps and guides at these two towns, then discuss it further over dinner. The more we look at it, the better a plan it sounds. After dinner we explore the few backstreets of Cameret. We find a late night café in a tiny square. They have some board games, whose rules we can not begin to fathom. One of them however looks like a four-sided game of draughts (checkers) four sets of coloured counters for four players. We try this out. Lindsey seeks to hang back but also form defensive pacts. (She is France) Mike is prepared to build coalitions, but only in the interests of aggression, and forming a two-pronged attack. Truth be told, he’s really more interested in a total bloodbath. Mike is Nazi Germany. I try and go it alone, temporarily offer to collaborate with Mike. Then I try and stab him in the back, once he has fatally dived his forces. Does it work? No it doesn’t. I am Stalinist Russia. But unlike Russia, a clear winner in WWII, my treachery backfires horribly. I am wiped out, even before suicidal Dave. It’s a sobering judgment. Almost certainly a cue, for some a deep soul- searching moment of reflection, maybe even a change in life direction. I order another round of beers instead. The next morning, alas, Dave has to leave, returning to work in the UK. He will be missed. We other three press on. It’s a bit like the Lord of the Rings, and the ending of the first fellowship of the Ring. We must continue. Toward our new destination, towards, who knows, a new destiny perchance. October 3, 2012 April 14, 2013 Arran HendersonUncategorizedComic Writing. It is a profound truth that when one finds himself facing “soul- searching moment of reflection, maybe even a change in life direction” that another “round of beers instead” is decidedly the wisest choice. Well done. I cannot wait for Audierne. Yes, soul- searching moments of reflection should probably be avoided, at all cost. Drinking beer is a better and far more reliable pathway to enlightenment & inner truths. Audierne will be shortly be appearing, on a computer screen near you. How was Mongolia? Or in fact, save your powder… I shall wait for the post. 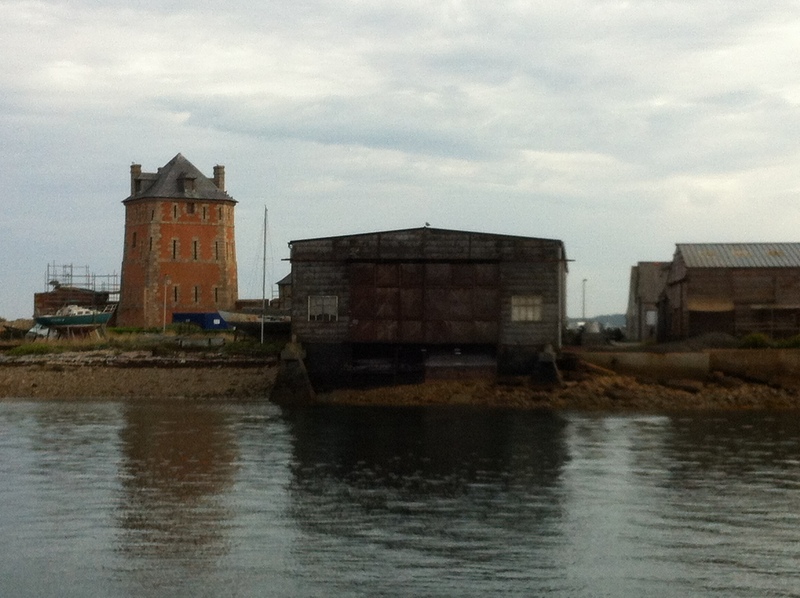 It’s so funny to see the centuries-old structures along the coast, and then suddenly the modern harbormaster building jutting out like a sore thumb. And I agree with A Spare Mind: any major decision should be pondered only after consuming at least one round of alcoholic beverages. I kind of liked all those streamlined little modern classics. Liked their wave-pattern sweeping roofs, and the echos of the sea. But you are both dead right about the beverage. We are all three of a mind ! 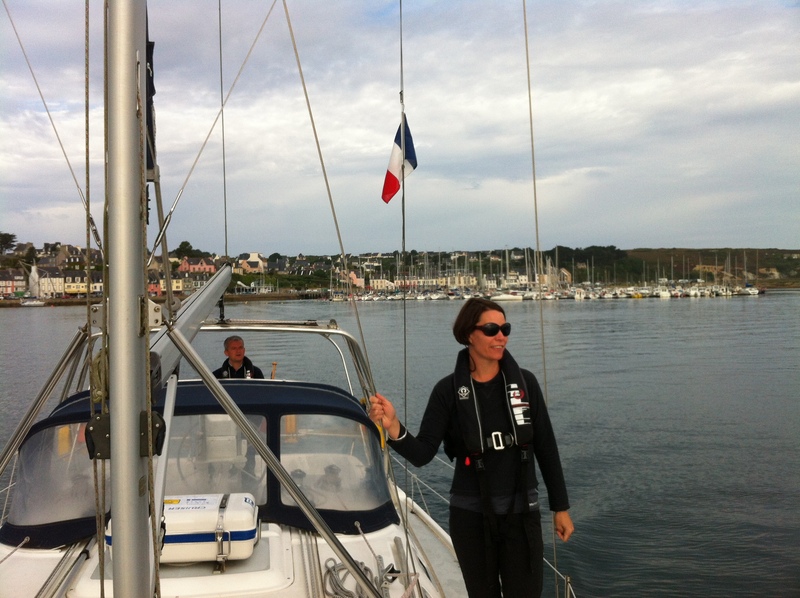 Previous Post Part V- Sailing L’Aberwrach to Cabernet-sur-Mer… Man overboard! 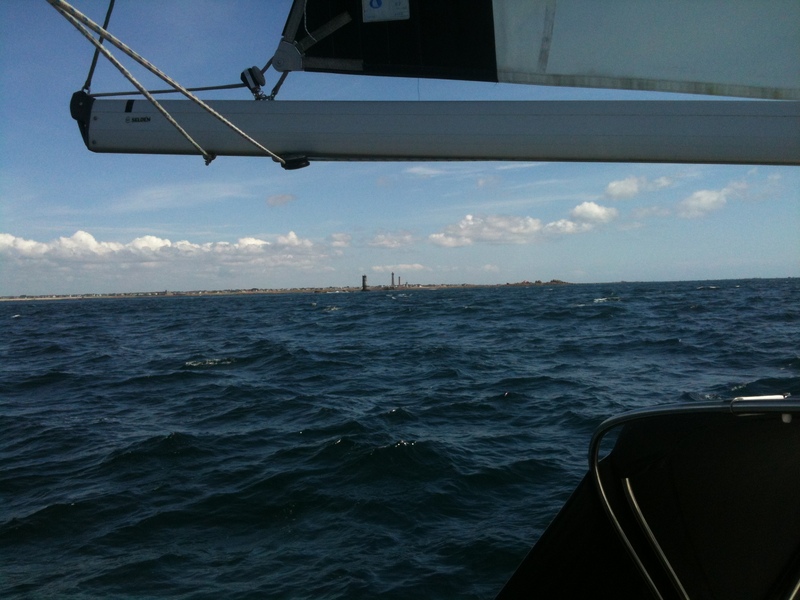 Next Post Sailing Brittany part VII- Cameret to Audierne.